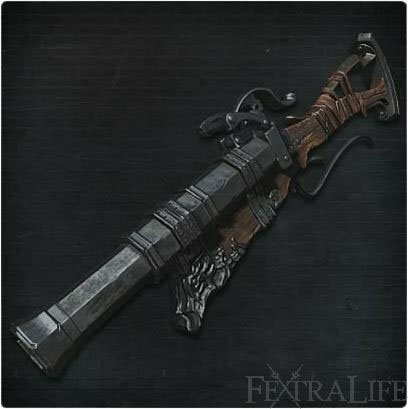 Hunter Blunderbuss is a Firearm in Bloodborne; it's one of three "shotgun" firearms in the game. "A blunderbuss created at the workshop for the hunters' line of work. Hunter firearms are specially crafted to employ Quicksilver Bullets fused with the wielder's own blood, boosting damage against beasts. The impact of this highly-effective weapon counters beasts' swift movements, and its wide spread is nigh-on guaranteed to hit the mark." This particular firearm is one of two "shotgun" firearms that is wielded in the left hand. If you have 27 Bloodtinge or less, Ludwig's Rifle is more powerful in terms of damage. From 28-32 Bloodtinge they have the same damage. From 33 Bloodtinge on up the Hunter Blunderbuss does more damage. This takes into account the distance you are from the opponent. However, in reality it can wielded on any character regardless of Bloodtinge levels since the utility it provides alone is useful. It's available in the Hunter's Dream at the Bath Messengers. First, you must obtain the Saw Hunter Badge in the sewers next to the Giant Boar on a corpse. At the beginning of the game, it's available as a gift from the Messengers if you choose. Remember that both firearms still have the same trigger speed on the initial shot. The Hunter Blunderbuss is extremely useful for staggering enemies at point blank range. It can also be a viable damage option when fighting opponents up close as well. Remember that the damage dealt will decrease rapidly if the opponent is standing far away from you. When choosing between the Hunter Blunderbuss or Ludwig's Rifle, keep in mind the distance that each firearm covers. Ludwig's Rifle can harm opponents with more damage from a longer distance, but it has a more narrowed spray pattern up close compared to the Hunter Blunderbuss. Furthermore, while both "shotguns" fire the first initial shot at the same speed, the Hunter Blunderbuss has a faster recovery time. In reality, you can easily make good usage of both "shotguns" and swap them up depending on the situation. The Hunter Blunderbuss has many similarities to its real life counterpart. The modern day shotgun derives from the blunderbuss heavily, especially as a close-ranged defensive firearm. Djura uses a form that borrows designs/mechanisms from a olden day muzzle-loading firearm combined with a short, large caliber barrel, which happens to be the same style the Hunter uses. Father Gascoigne uses a blunderbuss in the form of a handgun. It's actually in the design of the Hunter Pistol, but it behaves like the Hunter Blunderbuss when shot. Prior to release, the Hunter Blunderbuss had the same model as the Pthumerian Watchers. The lever on the top of the Blunderbuss looks like it may operate a breech block for loading in a shell. Can it one-shot a player at 99 bloodtinge? Compared to the pistol, does this have a higher chance to proc a VA? Im ***** at the timing compared to parrying in Dark Souls, and I don&apos;t care about damage with firearms. I use them primarily for VA.
Did some more cleaning up, trying to keep a more uniform appearance among the firearms. Ok, so I&apos;ve been planning this for a while, but I finally figured out how to implement a new image when doing these edits (wasn&apos;t that hard, should&apos;ve done this edit a long time ago). GIFs involving a blunderbuss were surprisingly scarce, so I just re-used this one from an earlier page because why not watch Djura blasting a scrub into bloody pieces? I would expect the Blunderbuss class to have much higher damage and stagger than the pistol class, but fire slower and have much shorter range. Since that&apos;s not the case at all and the weapon is mostly there just to give the player breathing room early game, I would recommend never upgrading this weapon. If you want more damage but dislike the Pistol, Repeater Pistol, and Evelyn, I recommend using Ludwig&apos;s Rifle instead unless you are going for a high Bloodtinge build for the Chikage. Upgrading the Blunderbuss does not increase its impact stagger or its range, so the materials are wasted on it. This may change in the future if From Software ever decides to change the nature of the Blunderbuss. "The Hunteers blunderbuss is based off of a blunderbuss". Jesus christ that blew my mind, I never knew that.